(Photo credit: Esther Lin/Showtime) WBO super featherweight champion Mikey Garcia thinks that former WBA/WBC light middleweight champion Saul “Canelo” Alvarez (43-1-1, 31 KO’s) is going to have his hands full on Saturday night against the slick Cuban southpaw Erislandy Lara (19-1-2, 12 KO’s) in their catch-weight fight at 155 pounds. Mikey sees Lara as going into this fight with a lot to prove to boxing fans, because he wasn’t given a shot by Canelo all these years. Lara is now getting his chance against the 23-year-old Canelo, so he’s going to want to perform well and show boxing fans what he’s all about. You can make an argument that Lara would have the same record that Canelo has now, possibly even better, if he had faced the same opponents that he has his entire career. The two guys that Canelo has fought during his 9-year pro career are Floyd Mayweather Jr and Austin Trout. Lara already soundly beat Trout, and it’s unclear how he’d do against Mayweather. Lara hasn’t had the same kind of backing that Canelo has with Golden Boy Promotions putting him in with a lot of guys like Kermit Cintron, Josesito Lopez and Shane Mosley. It would have been interesting to see how heavily Lara would be right now if he were matched against the guys that Canelo has with the publicity that he’s received for his fights. Canelo will very likely be coming into this fight with a number of different plans to try and deal with Lara’s boxing ability. Canelo has obviously learned from his loss to Mayweather that he can’t try and out-box guys with better skills than him. For that reason we may see Canelo on a seek a destroy mission against Lara on Saturday night where he attempts to duplicate what Alfredo Angulo did in part by forcing Lara to fight by cutting off the ring. 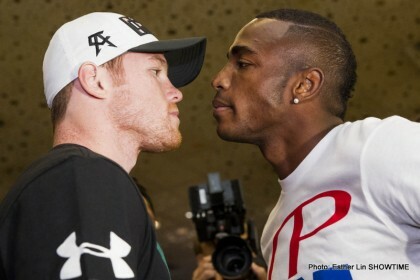 Canelo really isn’t a pressure fighter though, so it may backfire on him if he tries to take the fight to Lara. Besides that, Lara usually does well against guys that take the fight to him with the exception of his fight against Angulo.